This is the baby I'm working on. Its a screenpack I'm developing for MUGEN 1.0. This is my first project but I've been working on it for a few months now. I'm planning on giving it about 24 slots Though I am considering 30 slots. I was thinking about Lifebars as well but due to my small coding knowledge that may not happen. 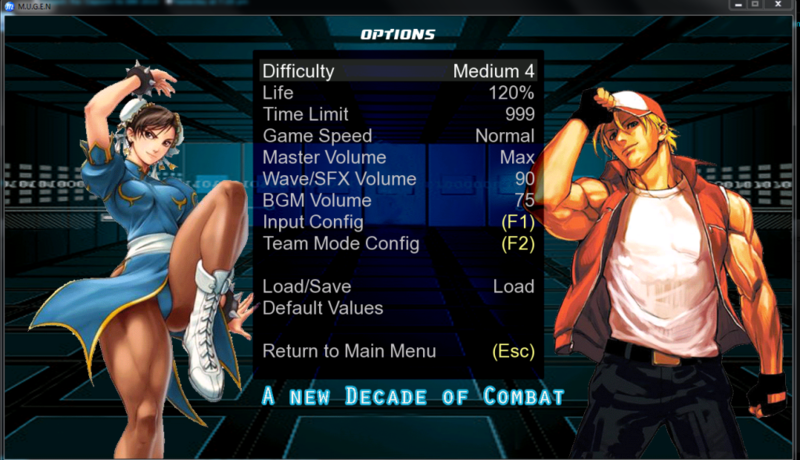 I'm making it it to run at 1280x980 which is like the HD equivalent to the old 640x480 resolution of the original mugen. I made it this size since it was the easiest way for me to fix issues I had with character groovebars not showing up and lifebars being huge on the screen. No screens of actual fighting since its nothing we haven't seen and the lifebars aren't mine so I don't want to compromise my credibilty by showing someone else's work in my thread. I'm still working on the VS screen too. C&C is welcome and encouraged and please say which one of the select screens would you like to see finished up for the final build. On a side note I'd like to ask for anyone who is good at sprites/animation to please lend a hand and help me out with the BGs of the screens and maybe lifebars. If not I'll just wing it. The renders on the title screen look out of place IMO. Also the select screen looks kinda plain but that is not necessarily a bad thing. At least it isn't cluttered up with a bunch of useless crap like some other screenpacks I have seen before. Coming along nicely, my only gripe about the renders on the title screen, is that some look scaled while the others look so large. But the select screen looks pretty cool, I like it. Keep us updated. @Quicksilver - What else would you suggest for the menu aside from a font change. And any ideas for a new BG? I kinda stuck with the same one since I couldn't think of much else and spriting isn't my strong suit. Thanks for the comments so far guys. I appreciate the feedback. Ok guys I took some time and sat around to ponder on the comments that you left me. I thought about the easy fixes first which was the renders. I got rid of Chun-li and Terry plain and simple and just worked on Ryu And Kyo to make them fit. Then I took into account what Quick mention about the menu fonts. I added Osaka Sans Serif to the font list and made that the menu font.You guys should recognize it since its the same font as the buttons in the navigation bar for the forum. The "major" change is that I changed the color pallette of the menu screen. Orange was cool but after i added the fonts It felt a little off to me. So I changed it to blue and i think it helps to make things pop. here's a screen of it in 1280x720. I'm starting to think maybe the resolution should be toned down for this one since there isn't much out for the HD Mugen scene yet interms of character or stages. The only real reason I'm sticking to the HD version is because it allows the use of WAVs,OGG and MP3 files for bgm. Anyway here's the new menu screen tell me what ya think. Much better on the select screen in my opinion. Maybe you should go for more difficult stuff now, like adding an aura animation behind Ryu and Kyo, preferably making Ryus blue, and Kyos Red and make it pulse or something. I'm thinking either 24 or 30 character slots. The first select screens I have in the first post have the 24 slots. In terms of art style I'm leaning toward Capcom. Click to see it at a bigger size. Its BLUE!!!! And has HEXAGONS!!!!! New Fonts, The title is Osaka Sans Serif but the Name & Stage fonts are 7DAYSFAT. Anyways what do you guys think? I know its not a major change but I like to show progress even it its just a little bit. Much better, your going somewhere with this! I rather like the idea of custom ports for that, they would look nice. 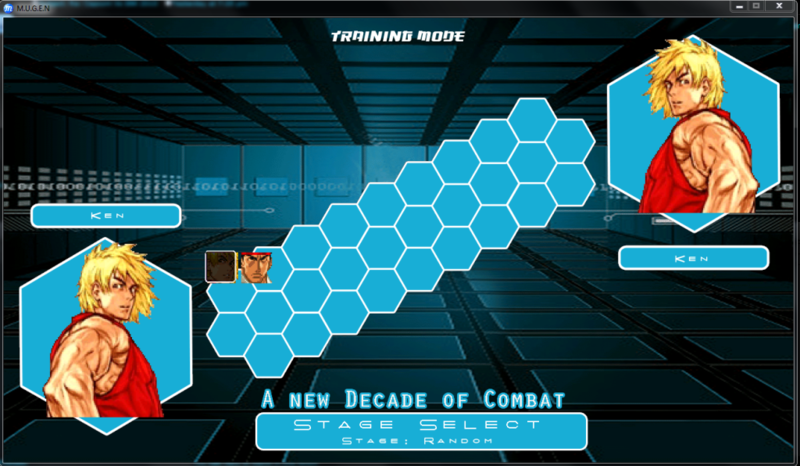 Also, the training mode font, I still am not digging it too much. It is getting tons better though, congrats. Update on the character select screen. TREMENDOUS.....wil there be secret characters? Boosie Badazz I'll Spit On Ya! I'm gonna take you up on that one Quicksilver. Thanks for the feedback guys. Its still a little ways of from completion but its definitely going in the direction i want. Got some new screens for you guys to look at. I'm gonna stick with this new version of the select screen for the final build since I couldn't get my other design to come through. As for the VS screen its still a work in progress. I can't say I'm exactly happy with it. If you guys have any ideas as to what i can do to make it more than what it is I'm open to them. Here are the goods. Portraits are still in the works for the Select Screen. So far I'm seeing a set of 4 custom portraits for the characters. In addition to the portraits I still have to the actual Victory Screen, and animations for everything before I can call this thing complete. I was gonna try to upscale and use a set of lifebars by Hloader since he gave me permission to use them in the screenpack but I wanna go and make my own. What do you guys think? can you show us how the lifebars look in battle so we can see if the lifebars go well?